It was on Wednesday, June 19th and the Dodgers were playing a double dip with the Yankees in the Bronx. 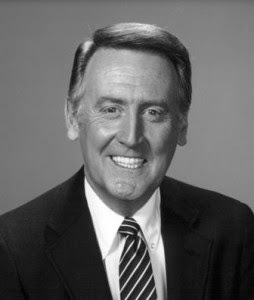 Legendary announcer Vin Scully didn't make the trip and was follwoing the game via Twitter of all things. The Dodgers were floundering deep in last place with a 29-40 record, a full 8 games behind the Diamondbacks, (it would get worse a few days later when they hit their low watermark on the year at 30-42, 9.5 games back). But Vin Scully has a way about him. Even if he's writing a message via twitter. When Vin says something profound, I listen. When Vin makes a comment that is indicative of something positive, I feel better. Maybe it has something to do with growing up with the man and listening to his cadence for 140+ times a season, year after year after year. "Kemp back, and Crawford back, to go along with Gonzalez, Ramirez and Puig. I have to believe they'll make a run." That's all it took. It made perfect sense. Someone else could have said it, and I would have brushed it off, but not Vinny. The master behind the mic for 64 seasons has seen it all and if he hasn't lost hope, why should I? Now here we are, 12 days later, with the Dodgers 4 games back in the standings at 38-43 and Vin is looking like a prophet. No surprise of course. The man knows his baseball and he's seen enough of it to know that the season was not lost. I have never been one to get excited about trade rumors, especially those invented by a lowly blogger that has no connection to anything, such as me. But the Alex Rodriguez situation in New York has gotten out of control and I believe he would be a good fit in Los Angeles. Please note that i have seen no reports that the Dodgers are even interested in him, but as the trade deadline approaches and drama in New York surfaces, maybe we'll hear something on this. Rodriguez is completely on the “outs” in New York and possibly on his way out of baseball. He has been linked to the Miami Biogenesis PEDS fiasco, and coming off a lacklaster performance in the post season last year in which he was benched by Joe Gurardi, ARod has been unable to return from injury this season. It appears that the Yankees are content with having him retire from the game with 647 lifetime homers due to injury, and collect from insurance for his monstrous $100 million owed over the next four and a half years. Rodriguez is 37 years old and not in good graces with Yankee G.M. Brian Cashman, who tweeted that he needed to “shut the $#% up,” when Rodriguez sent a message via twitter that he was close to returning to baseball shape and to the field of play. I’ve never seen a G.M. react in such a way in a public setting. We know they do so in private, but Cashman simply blew it by not playing his emotional cards close to the vest. ARod is persona non-grata in the Bronx and I would think that if he wants to resume his baseball career, it’ll have to be in another city and with an organization that is willing to take on his baggage and probably a chunk of his salary. Now, third base has been the one spot that Dodger fans have been claiming they need an upgrade. As pleased as we have been with Juan Uribe’s year so far, even in Juan’s best year, he doesn’t approach ARod in his worst year. Do they dare take a flyer on the controversial Rodriguez? There are only a few circumstances in which they may want to consider it. 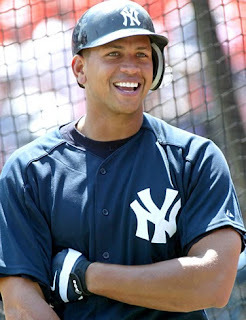 First) Arod might be staring a 100 game MLB suspension smack in the face for PED use. That needs to be resolved from the get go, otherwise, there’s no point in acquiring him. Second) The Yankees will have to pay a substantial portion of his remaining salary, perhaps as much as 75% of it. Interestingly, the expensive years of Arod’s contract have just about lapsed. Though he is owed $28 million by the Yanks this season, ($14 million left to be paid), in the subsequent years, his salary decreases, age 38 (2014) $25 million, age 39 (2015), $21 million, age 40 (2016) $20 million, age 41 (2017) $20 million. Now if the Yankees are on the hook for 75% of that, ARod could be had for $7 million next season, and around $5 million the remaining 3 years. Rodriguez may have to completely restructure his contract if he wants to continue playing baseball for another team. It should be noted that the Yankees may want to deal with a club that is willing to send them a big name and huge contract in exchange. Someone like a Chase Utley from Philly, who could fill in at first base for the injured Mark Texeira. But if the stars don't align right, maybe a deal with the Dodgers is possible. Let me add this. The Yankees will probably never agree to eat so much of this contract knowing that the deep pocket Dodgers might be in play, but maybe they won't hace a choice. No matter how much they try to sugarcoat things, Cashman has let the world know that Rodriguez is unwelcome in Yankee Stadium. You know after the playoff fiasco last year (and the notes sent to the female fans in the 9th inning of the elimination game), Rodriguez is going to be very unpopular with the Yankee faithful. Yet, ARod still wants to play. It’s got to be in another uniform though. Third) An intense physical examination from a team of sports doctors must give Rodriguez a clean bill of health. If the hip is done, then his career should be over and Lloyds of London can battle it out with the Yankees over who pays his salary. Fourth) Deep back in my memory I seem to recall that Rodriguez grew up a Dodger fan. I know when he was drafted, he was hoping the Dodgers would be able to select him. Maybe that puts him in play with Los Angeles. The Dodger roster stacked with superstars might be a good fit for him too, since he won’t have the pressure to carry the team by himself as the biggest name star on the club. Rodriguez brings a lot of baggage with him. He’s unpopular. He’s perceived by may as spoiled and as a somewhat selfish ballplayer. He’s never been much of a teammate and despite the one championship with the Yankees, he still has the reputation of failing to win the big games. We can look at all those negatives in one way though, and that is he’s got a lot to prove. He probably wants to end his hall of fame career on a positive note. There are those that are saying I’m nuts for considering this, but look at ARods numbers even in these down years. He hits in the .270s, his OBP is in the .360’s, he’s OPSing in the .800s. The man is still a threat even as 50% the player that he used to be. Now how much his performance over the last few years is steroid induced we can’t say, but with a restructured deal for a player that wants to prove himself, maybe this could actually end up well. Corey Seager is 19 years old and 3 or 4 years away. Rodriguez might be a perfect fit for three years while the kid develops in the minors. The question would be whether ARod is willing to restructure his deal to three years vs. the four that he has remaining. Otherwise, at the end of the contract, the Dodgers would have to eat some salary. Or he'll be an expensive tutor and bench player at the end. In tonight's action I noticed Carl Crawford cheerleading in the Dodger dugout after Hanley Ramirez's monstrous 439 foot home run to dead center field. With all the Puig excitement and the return of Kemp to the outfield mix, many of us have forgotten Crawford and the fine season he was having up until his severe hamstring injury. He is a valuable contributor and with the recent Dodger enhanced lineup, he can really help the ball club. The inevitable will occur and Crawford will return this year, probably around July 5th after he completes a minor league rehabilitation stint. At that time the Dodger outfield will have 4 starting outfielders for 3 spots. It's a problem, but I believe, not too much of one. If Mattingly handles this situation right and the four guys are mature enough to handle it, there should be enough shuffling and days off granted to each of them to allow the older guys and those returning from injury to be given some valuable rest during the pennant race stretch run. Of course, Puig should never get a day off in my opinion, but we'll see. Aside from Hanley Ramirez's hot bat, it has been a pleasant surprise to see him playing some decent shortstop. Hanley's defense at short was a major concern for many of us going into this season. As he makes the plays and covers ground out there without any hiccups, I must say that I didn't expect this. I was convinced that Ramirez needed to be a third baseman for the remainder of his career. The Phillies have out hit the Dodgers in the first three games 46 to 18. That 16-1 loss only meant one "L" in the standings. Tonight's 4-3 victory was sweet when you consider the schalacking they took on Friday. A win tomorrow and the series goes 3 out of 4 for the Dodgers and they will have been outscored by a substantial margin in the four games. That doesn't do much for their Pythagorean W-L record, but who cares? Dodger "d" in the top of the ninth was about as ugly as I've ever seen it. Good teams overcome those mistakes. Maybe this team is good enough to do that now. As the Dodgers won their 6th straight game tonight, rumors swirl about the potential acquisition of Miami’s Ricky Nolasco. I find the rumors rather disappointing, as it is my position that Stephen Fife can fill the role of the 5th starter adequately and Nolasco doesn’t bring much beyond the current Dodger right hander in place. Meanwhile if the cost is Withrow (who should still be on this club), and Pederson or Chris Reed, Colletti will have emptied the Dodger prospects cupboard for a number 5 starter that they didn’t really need in the first place. Sometimes the best trades are the ones that aren’t made. That’s the way I see this potential deal. Yasiel Puig continues to prove to be the 8th wonder of the baseball world. His clutch two out hit on and 0-2 count in the 7th inning tonight was amazing. Reaching down a that outside slider and driving it to left field was simply a super human feat. This kid is so strong. I’ve never seen anything like it. So with that said, I have a few concerns. Those concerns mainly have to do with Puig’s Pete Reiser-like attack of outfield walls. I appreciate Puig’s enthusiasm and his willingness to go after balls approaching the wall with a reckless abandon, but someone really needs to make him understand that we need him healthy. It’s called a “warning track” for a reason. When you reach it, it doesn’t mean to increase your speed. 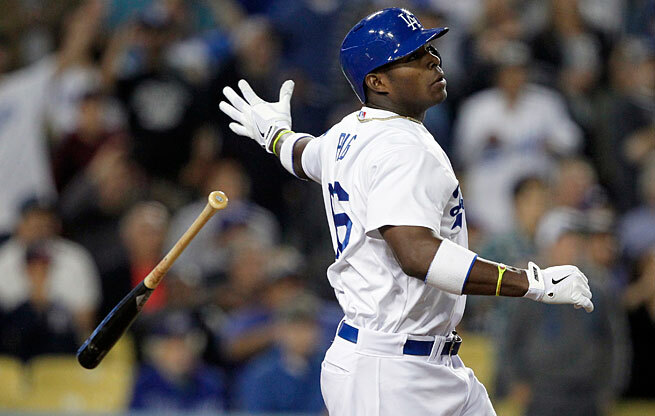 At the rate that Puig is going, I’d find it an outright miracle if he concludes the season without serious injury. Considering that Yasiel in my opinion is of a talent level of a young Mickey Mantle, I’d hate to see him seriously injure himself and have us all talking about “what if” he didn’t hit that wall and tear up his shoulder or “what if” he didn’t break his ankle sliding into a concrete wall. We say that about Mantle, who lost his amazing speed when he stepped in a hole or sprinkler head (can't remember which one it was) in he ’51 World Series. 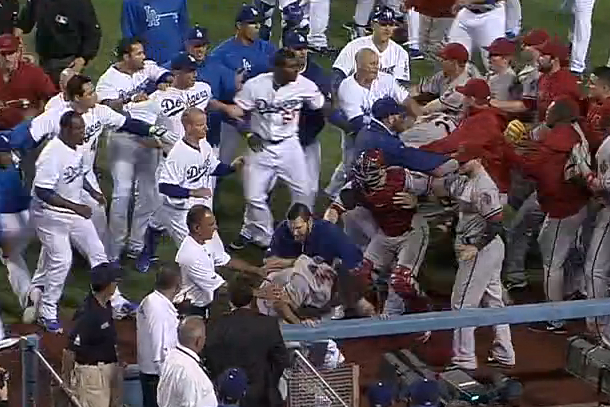 Puig needs to protect himself from Puig. We’ve heard Mattingly say in interviews that the coaching staff doesn’t want to temper his enthusiasm and hustle, but there has to be a comfortable medium in there somewhere. We want Puig to be that Dodger hitter that we talk about 50 years from now, that phenominal once in a generation player that breaks all the records, wins numerous awards and leads the ball club to several championships. That is the big picture. Injuring himself would be beyond tragic. They need to keep this great player healthy. One of the first things the Dodgers can do is get rid of that cut out video board in the right field wall and replace it with as much cushiony padding as possible. Puig has now collided with that thing a few times in this homestand. Mid-season this change probably isn't doable, but during the odd-season, it has to be done. Remember when Darryl Strawberry separated his shoulder crashing into the unpadded right field wall in his first season with the Dodgers? Well, they padded the walls after that. This ownership group needs to be proactive and make a similar move and remove that video board. That just might save Puig from himself. If there ever was a time for the Dodgers to put together a prolonged winning streak, now is the time. NL west rivals all seem to be hitting tough stretches in the schedule and the Dodgers are no exception to that rule, but the time to make a move is now. The first place Diamondbacks (42-35) continue a tough road trip with 2 more in Washington, a weekend series in Atlanta and four in New York with the Mets. They then follow up with a home series that includes the Padres and Dodgers. I seriously look for the D-Backs to fall back into the pack. The reeling Giants (38-39), losers of ten out of their last fourteen games and five of six, will play three in Colorado after facing Kershaw at Chavez Ravine tonight. They then travel to Cincinnati to face the hot Reds for four before returning to their China Basin ballpark to face the Dodgers again and then the Mets. Watch for the Giants to fall significantly under .500 by the time this road trip is over. The Rockies (39-39), finish off their road trip in Boston today before returning home to face a makeup game with the Mets and then series’ with the Giants and Dodgers. The Rockies then head off on the road again to play NL West foes Arizona, Los Angeles and San Diego, all before the All Star break. It’ll be a crucial two weeks for the Rocks who will have to do it without their best player, Troy Tulowitski. Then there are the Padres (39-39). A team that has surprised us all, but also dealing with a plentiful amount of injuries. The Friars have one more home game with Philadelphia before heading off on the road to take on a resurgent Marlins team for four, a three game set at Fenway with the Bosox and three in the nation’s capital against the Nationals. It'll be a tough roadie to say the least. So as the Dodgers continue on their longest winning streak of the year, they couldn’t have picked a better time for it as all of the NL West foes are hitting a rough patch on their schedules. Getting healthy couldn’t have been timed better. This is a time to make a move. It won't be easy as the Dodgers have one more with the Giants and then four at home with the Phillies. They then take off on the road against the Rockies (3), Giants (3) and Diamondbacks (3) before returning home for three against Colorado again before the break for the mid summer classic. All are games against teams ahead of them, giving them ample opportunity to move up in the standings. 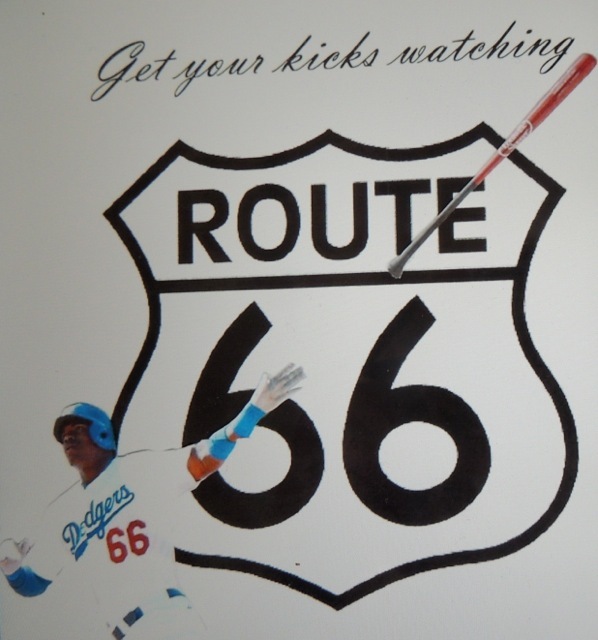 After spending a whole 3 hours on this and with apologies to Mike Brown and theLFP.com (Left Field Pavilion), I present my tribute to art and the world of Yasiel Puig, the most amazing talent to emerge upon the Dodger scene since....well, since ever. Opposing pitchers are already suffering from Puig Fatigue. Go get 'em Yasiel! This morning on San Francisco radio, Josh Suchon was interviewed about the upcoming Dodger-Giants series and additionally he was given an opportunity to plug his book on the ’88 Dodgers, Miracle Men, (Note: LINK HERE to my review of Josh's excellent book on the last Dodger championship team). In the course of the interview on KNBR radio with Brian Murphy, the topic of Matt Kemp was discussed at length, since he’s currently under-going a rehab assignment at Albuquerque, where Suchon works as the play by play announcer for the Isotopes. It has always been the macho thing for players to never give excuses when they are slumping. Kemp has never been the type of player that would admit that an injury is hindering his performance, but in a conversation with Suchon during this rehab assignment in Albuquerque, he has subtley admitted that the shoulder injury has sapped his power. “He admitted that he hasn’t been able to follow through,” said Suchon when asked about Kemp. “He has a very high follow through. He hits those majestic home runs that seem like they’re never going to come down and land to straight away center. He hasn’t been able to get that extension with his shoulder and he said that while he was on the disabled list for the hamstring injury, he was finally able to build up the strength in that shoulder and be able finish the way that he has." So now that we have some confirmation on what we all suspected, and that is that Kemp was playing at way less than 100%, that should be good news now that he’s saying that he has been able to build up the shoulder strength and he can follow through with his swing, right? Well maybe so, but there’s the question of re-gaining his timing and most important of all, getting his mind right and mastering the mental aspects of the game. Additionally Kemp is working on some minor mechanical adjustments that he believes will get him going, one has to do with his timing which is a shortened leg kick. “He’s worked on things and he’s tried a new thing where he’s not going to have as much of a leg kick that he had before." In Kemp’s eight plate appearances in Albuquerque, he has struck out five times and doubled once. His hamstring seems to be healed as he stole a base as well. Suchon believes that this is the norm when you’ve been away for a few weeks. Timing of in-game conditions doesn’t come back over-night. Adrian Gonzalez homered in the top of the ninth inning to lead the Dodgers to a 3-1 win over the Padres. It has been a while since the Dodgers had back to back homers in a game. In fact, today was the first time the Dodgers have accomplished the feat in 2013. In a game where Bud Black pulled a page out of what so many modern managers do these days, and lifted Andrew Cashner after his starter had held the Dodgers to one run, throwing 91 pitches through 8 innings, we'll take the charity. Houston Street to the Padres looks to be what Brandon League was to the Dodgers in the closer's role. Street is 0-4 with a 4.78 ERA. He's had the propensity to give up the long ball this year and he did so three times to the Dodgers in this weekend series. Black will probably be feeling the heat to remove him as the closer soon as he has a lot of more attractive options in the Padre bullpen. Things didn't look too good after 7 innings for Los Angeles with the game tied at one the Dodger bullpen that has failed time and time again, was handed the ball. The bullpen guys pulled through today. Fine innings were pitched by Rodriguez, League and Jansen. Even Moylan, who gave up a game tying homer, looked good, aside from the hanging breaking pitch that he threw to old nemesis Carlos Quenten. 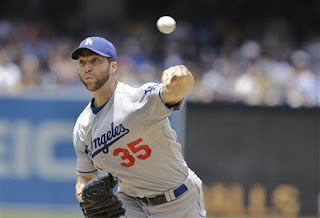 Chris Capuano, pitching on three days rest, had his second consecutive quality start and his emergence on this struggling staff will be huge if he can continue to perform as such. Capuano went 5 innings, allowing 0 runs, 4 hits while striking out 5. He threw 74 pitches and was lifted for a pinch hitter in the sixth inning, probably due to the short rest. It was a pleasant surprise to see Capuano pitch like he did during the first half of last season. The biggest mystery of the game and series that I have found is Yasiel Puig's position in the batter's box. He's standing so far away from the plate, that the floundering swings he takes at low and away junk is nearly impossible for him to hit. With a 1 for 4 day at the plate (from a squib single early in the game), Puig's average is still well over .400, but I'm assuming that his position in the box is something that McGwire is instructing him to do. I can't figure out why, but what do I know about hitting on the major league level? There must be a method to their madness. Curious happenings in AT&T Park in San Francisco. Former Dodger Nathan Eovaldi stymied the San Francisco Giants in a 7-2 Marlins win today. Giant announcers were completely shocked that he was throwing 97 MPH fastballs on the black all day long as he went 6 innings, while striking out 7. Good for Nathan, we could sure use him now, but it's nice to have a hot Hanley Ramirez in exchange for him. Just how bad can things get? Apparently pretty bad. 30 wins out of 72 games is a pace to set team records for futility. Even if the Dodgers ran the table with wins up to the half-way mark of the season, they’d still be under .500. And if that happened, we’d all be giddy with excitement because aside from the first week of the season, the Dodgers haven’t rolled up a three game winning streak. Puig brings excitement, and that makes the games fun to watch still, but after his plate appearance is over, what are we doing? Well I know that I’m counting how many men are in the batting order before Puig comes to the plate again. Even Clayton Kershaw can’t save this club. He’s bound to have some lackluster performances, but they are magnified when this ball club is awful, which has been pretty much the entire season. A 5-5 record with a 2.06 ERA says it all. It's getting to the point that I'm actually thinking that perhaps a last place finish won't be so bad since they'll be selecting one of the top 5 players in the draft next year. That is pathetic and something that Dodger fans do not deserve, but it is what it is. One thing that has certainly gone unnoticed is that Dodger fans lead the major leagues in attendance this year. I credit our "fickle" fan base for sticking with these guys, because they certainly don't deserve it. Baseball fans can poke fun at the beach balls, the wave and the "arrive late-leave early" stereotype, but there's no denying that more Dodger fans move the turnstiles than fans of any other team in baseball. Kudos to us for sticking with these under-performing millionaires through this awful, awful season. If you can’t win within the division, forget it. The Dodgers are a combined 9-22 against Western Division opponents, and that isn’t going to cut it if you want to contend. 4-6 against San Diego, 2-7 vs. the D-Backs, 1-5 with the Giants and 2-4 when facing Colorado. This is by far the worst inter-division performance by a Dodger team in decades. 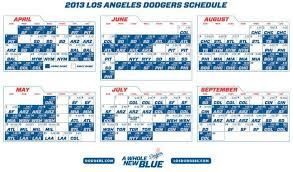 Now the schedule has the Dodgers facing division opponents 19 times before the All Star break arrives on July 14th. It is during this stretch that we’ll know whether this ball club has the fortitude to change trends and start winning on the West Coast. In an interesting scheduling quirk, from July 14 to August 30th, the Dodgers don’t have one inter-division contest, and then as always, they finish up in the final month playing inside the division with 26 games against western rivals. As they currently sit 8 ½ games behind division leading Arizona, if they’re ever going to do it, now is the time to make a move. With that month and a half in mid-summer against opponent s outside the division, making up distance in the race in the dog days of August is going to be real difficult to accomplish. In last night’s action at San Diego, once Fife departed following the 6th inning, the continuance of Dodger bullpen failures emerged again. In what I seriously thought was a strength of this ball club when the season started, has turned out to be a severe weakness and overall disappointment. It is the cause of substantial losses this year. Matt Guerrier was completely inadequate again. Paco Rodriguez didn’t’ help much and Peter Moylan was hit hard. A decent pen last night could have produced a win as the Dodgers rallied in the 9th. 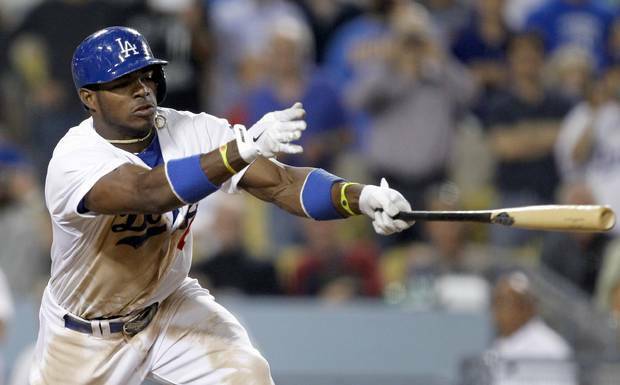 Yasiel Puig homered in his first at bat last night. He hit a fastball that was up and on the outside portion of the plate, muscling it over the right center field fence. An impressive shot to say the least, since it’s never easy to go opposite field at PetCo for a right handed hitter. That was the last fastball he saw on the night, and I’m fairly certain it may be the last fastball he sees in quite some time. Padre pitchers mixed up an assortment of sliders low and away and off speed junk that the rookie swung at and missed repeatedly the rest of the night. Don’t be thinking that this was an anomaly either. You know that scouting reports are being hammered away at this moment that identify Puig’s weakness and the fact that he swings at pitches that are low and away, outside of the strike zone. Actually I’m shocked that he hasn’t been pitched this way before last night’s action. Yasiel has shown that he learns quickly and usually makes adjustments immediately. This may take more than just a simple adjustment though. His whole approach to hitting is aggressive from the get go. Laying off that low and outside junk is going to require a different strategy at the plate for him. Puig has a lot of “show off” in him. That can be good, but it has its negatives too. We saw the negatives twice in the last two days with his errant throws in an effort to display his throwing prowess. Last night he aired a throw from the warning track to third base. He air mailed it. The throw had too much arch, was way over his cut off man’s head, and it allowed a second base runner to advance on the play. It was a rookie mistake through and through, and another error of enthusiasm. I tend to think that showing off his wares in the Big Apple might have gotten to Puig’s head. Someone needs to sit the kid down and kindly point out the mistake to him. I’m sure it has been done already because he tends to listen and not repeat those types of plays. He’s the most exciting talent to hit the baseball stage in a while and you don’t want to put the brakes on that, but baseball sense and baseball knowledge is to be learned. Yasiel has a ways to go…it’s that “raw” word surfacing again. I hate it, but there is no more accurate a term. These are the growing pains we’ll have to endure while watching Yasiel Puig become the best player in baseball over the next few years. I can live with that. October 3, 1963 - Game Two of the World Series. Sandy Koufax the day before had stifled the Yankee lineup in what was then a World Series record, 15 strikeouts in a 5-2 Dodger victory. Game two was a revenge match for the Bronx Bombers, who felt they could handle crafty left hander, Johnny Podres (15-13, 3.81 ERA). Podres, who beat the Yankees in game seven of the '55 series during his rookie year was now 30 years old. 1963 would be the last year that Johnny would be a regular in a major league rotation. His illustrious career was winding down and he was hittable. In the waning months of the season, Podres had surrendered 36 earned runs over 60 innings for a 5.40 ERA. The Yankees were countering with fireballing rookie left hander, Al Downing (13-5, 2.56 ERA, 4 shutouts). Gentleman Al started 22 games for New York in his first season and he led the American League with a K/9 ratio of 8.8. His veteran ball club was hungry to break out the bats after the masterpiece that Sandy K. threw. It wasn't to be. Podres reached back in his arsenal of pitches and gave a little extra. It would be the last hurrah for a great Dodger, whose career wasn't over by any means, but it was later shown that it was coming to a close. His best days as a pitcher were soon over. A crowd of 66,455 jammed into Yankee Stadium to watch the Dodgers break out to a 2-0 lead in the first, courtesy of a two run double by Willie Davis. It was a fortunate turn of events for the Dodgers, as Yankee right fielder Roger Maris made a rare defensive miscue, misjuding the Davis drive and playing it into a double. Maris would soon be out for the remainder of the sereis as he ran into a grandstand railing while attempting to field a Tommy Davis hit ball that resulted into a triple. By the 4th inning, the Dodgers led 3-0 on a home run by former Yankee great, Moose Skowron. Skowron had been dealt to the Dodgers in the off-season for Stan Williams. Moose's pals were sitting over in the Yankee first base dugout, and it was difficult for him to play against them, but he did with a flair. He batted .385 in the '63 series against his old mates, which turned out to be his highest post season batting average in his career. It was a surprise to Skowron that he was playing at all in the Series as he had difficulty adjusting to the National League and he hit .203 on the year with only 4 homers. But Walter Alston knew that historically he was a clutch performer in the Fall Classic and he wrote Skowron's name into the starting lineup in all four games. "I was garbage all year," he told reporters after game two. "I surely didn't expect to play in the series. And let's be honest, I certainly didn't deserve to." In the top of the 8th inning, with the Dodgers up 3-0, Tommy Davis laced his second triple of the day and drove in the Dodgers 4th run. Podres made it into the 9th inning to attempt to finish out a shutout, but was lifted with one out after Maris' replacement, Hector Lopez doubeld to deep left field. Ron Peranoski finished up the game, surrendering a single and the lone Yankee run crossed the plate before retiring the final two Yanks, Joe Pepitone nad Clete Boyer via groundball and strikeout. It was the final Dodger-Yankee day game at the Bronx in 49 years and and 8 months. Between 1941 and 1963, the Dodgers had played 23 day games (all in the Fall Classic, with the Dodgers winning 8 and losing 15) at Yankee Stadium. The string was broken today, as the first of a day night double header got underway. It's about time. For years the only inter-league matchup that I found to be interesting would be the Dodgers returning to old Yankee Stadium. For some unfathomable reason that only Bud Selig and MLB scheduling committee can understand, that traditional past World Series matchup never happened. Instead the Dodgers made two trips to Tropicana Field in Tampa and Rogers Centre at Toronto and five visits to such A.L. West opposing teams as Texas, Oakland, and Seattle. They failed to make one appearance in the Bronx. I’m a traditionalist that always believed that the mystique of the World Series was that the teams never faced each other after playing a full 162 games in the other league. There are those that laud Selig for introducing inter-league play to the game in 1997. I believe it to be one of his biggest mistakes. The scheduling of baseball set it apart from all the other professional sports leagues and as a result, such things as the World Series and even the All Star game were spectacles of a unique taste as we were witnessing the best from each league that needed to depend on scouting reports and the general unknown. Anyway, the Dodgers go to the new Yankee Stadium tomorrow for the first time. It’s a two game set that many anticipated and as the Dodgers head into the Bronx, they’re a full 10 games below .500 and in last place. The luster of this series has lost it’s sparkle. The Dodgers go there as an embarrassing cast of under-achievers in last place. 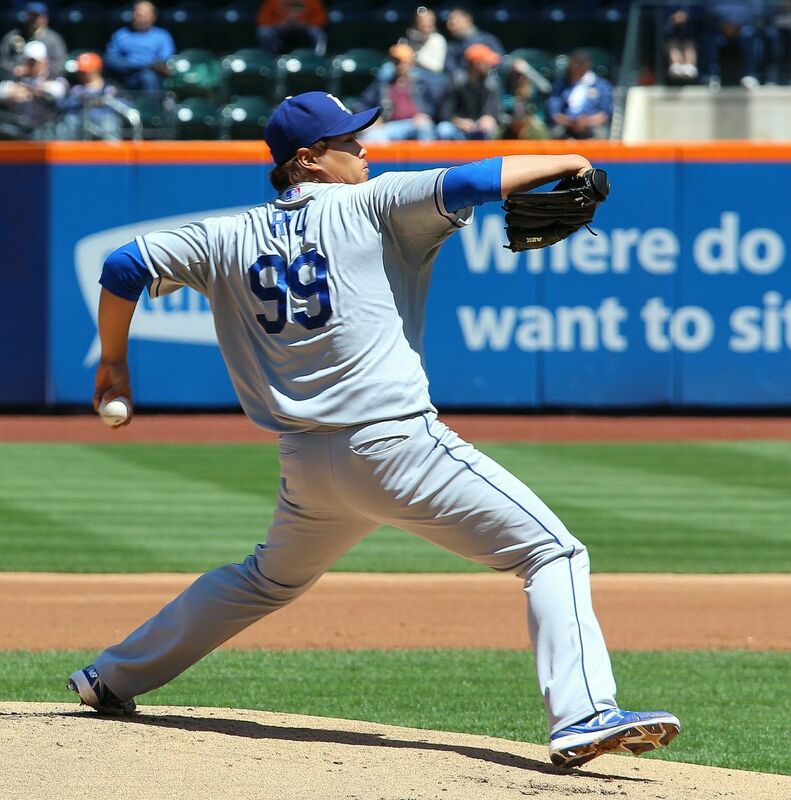 Hyun-Jin Ryu starts the first game in New York which I presume will have a respectable Korean fan presence, as he did when the Dodgers visited the Mets earlier this season. Hiroki Kuroda starts the second game against his former team. This isn’t quite the way we envisioned facing Kuroda in pinstripes. I was hoping it would be in the Fall Classic, just as the Dodgers faced former teammate Tommy John in the ’81 series or Bob Welch and Dave Stewart in the ’88 fall classic. Unfortunately, this is about as close they’ll get to the big dance. Hyun-Jin Ryu during his appearance in New York in April. 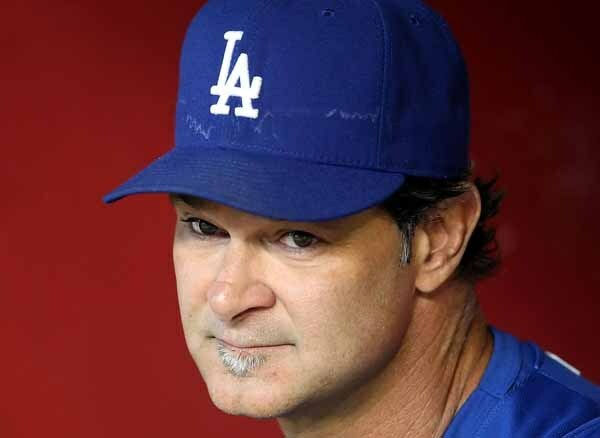 An interesting tidbit to this series is the return of Don Mattingly to his old roots. Mattingly, was a finalist to replace Joe Torre during the hiring process in 2007, only to lose out to Joe Girardi for the post. There are some Dodger fans that are currently fed up with the Dodger manager who could probably pinpoint that day as a dark one for the Dodgers as it resulted in setting the wheels in motion for the Torre/Mattingly era at Dodger Stadium. It’ll be interesting to see how Don handles the press corps from the big city that is known to be amongst the most brutal in sports. I’m fairly certain that had Mattingly been the manager of a Yankee team that was 10 games under .500 in mid-June, he’d have been run out of the manager’s chair. Who would have guessed that the San Diego Padres will be a formidable contender for the division crown? After a six game winning streak ( and 9 out of 11) over good opponents (Colorado, Atlanta and Arizona) they have moved a game over .500 and are sitting two games out of first place. They host the reeling Giants at Petco Park starting tonight, being a half game behind San Francisco and a game and a half behind Colorado. With a sweep of the Giants, the Pads may find themselves in first place by Thursday. Everth Cabrera has been leading the Padres. Unfortunately for the Friars, he injured his hamstring in yesterday's action and is likely headed for the disabled list. This is quite a feat for a team of nobodies that sat 10 games under .500 on April 23rd following their worst start in franchise history. Since the Padres 5-15 start, they are 30-19 all with a ragtag team of young players and a slumping and injured Chase Headley (.221 BA). Alonso, Gyorko and Everth Cabrera are carrying this team with their bats. (note: Cabrera injured himself in yesterday's action). Eric Stultz (6-5, 3.25 ERA), Jason Marquis (9-2, 3.63 ERA), Andrew Cashner (5-3, 3.52 ERA) are leading the staff. Eric Stultz? Can you believe that? It's the teams like the over-achieving Padres that can drive a Dodger fan crazy. I despise that team, but not as much as I'm angry with a Dodger team that can't stay healthy and is unable to hit with men in scoring position. If you think about it. This should be a year in which the Dodgers win the division. Arizona sits on top with a record just a few games over .500. The remainder of the division is within 2 games of that lead. A .540 winning percentage would be leading the division right now and the Dodgers are sitting at .426. Frustrating...but believe it or not, this thing isn't over. At least statistically that is. My guest post is over at THINKBLUELA.COM today. On Zack Greinke and the respect he has earned from his teammates. I was quite surprised to see that no Dodger players received any major suspensions. I truly believed that Puig was going to be forced to sit for a few games. I guess the MLB discipline committee looked at the whole picture and figured that getting hit in the face was punishment enough. Good call MLB. I'm still trying to figure out what Eric Hinske did to merit a 5 game suspension. 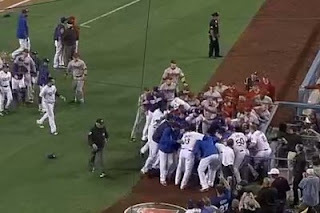 Perhaps MLB is privy to additional material from Tuesday night's melee. And Uribe got nothing? Amazing. He was leading the charge out of the dugout. Dodgers- fined (for having D.L. players on the field while the brawl ensued. Also the D-Backs and Dodgers will not be allowed to have players on the D.L. sitting in the dugout for any games this weekend. With the fracas and brawling in tonight's affair, the game certainly had it's entertaining moments, but I sometimes wonder why I still watch. I'm certainly glad I did, because it was one of the most entertaining games of the year. A rare comeback win for the Dodgers, who scored three in the bottom of the 8th to surge past an angry D-Backs team, in a beanball war that will most likely be remembered for a long time. The victory still didn't remove the bad taste from the previous evening's loss, which was a microcosm of the Dodgers 2013 season. Basebrawl tonight at the ravine. From day one of this season, it has been a disaster. It’s kind of like those traffic jams on the freeways. There’s an accident ahead and it has been cleared off the road for a time, but the jam continues because as you arrive to the accident scene, everyone slows down to take a look. Once past the scene of the incident, traffic starts to move. That’s the way it is watching the Dodgers. You watch. There’s a wreck ahead. You check out the injuries, and there are multiple ones. And you survey the damage, then you move on with your life. Get up the next day and do it all over again. When Puig ran out a ground ball and came up limping in the second inning tonight, I asked myself, “why do I put myself through this?” Day after day it’s bad news ad nauseum. At work there are the incessant wise cracks and there’s nothing that can be said to refute them. The team is awful, period. So funny that Mr. Brenly. Almost as funny as that time he played third base and made about eight errors in one game. Now THAT was funny. He added more comedic flare to his comments when he said the Dodgers were getting a lot of cheap shots in during the brawl and how he couldn't understand why Mattingly wasn't ejected after Kennedy beaned Greinke after he obviously threw at his head. Anyway, where was I? Oh, yeah. 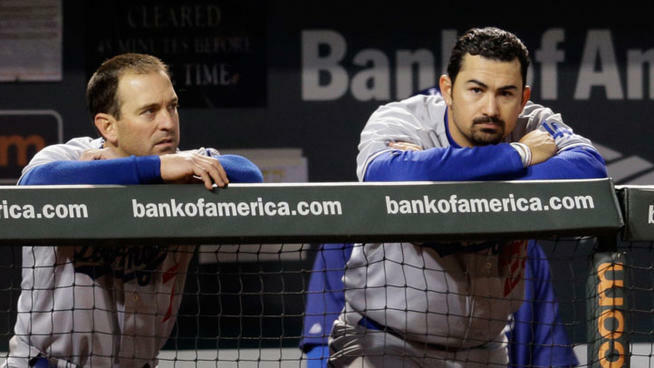 The trainwreck of the Dodgers season. Again, there are those calling for Don Mattingly’s head. I certainly can’t blame fans for wanting to change the manager. Mattingly’s insane loyalty to Brandon League up to this point has cost them games. When he started .130 hitting Luis Cruz in the 5th spot of the batting order the other day, I almost lost it. There are those decisions made by the Dodger manager that are just difficult to fathom, but as a fan, I understand that if Mattingly does get the axe, there is a pretty good chance that his replacement will be just as awful. Think about it. Over the years has there ever been a Dodger manager that didn’t drive you nuts with his decision making. ? I can’t think of any. Old timers that remember Walt Alston can't tell me that he was a fantastic strategist and pulled the right strings all the time. I remember him as a stubborn guy, especially in the later years. He had a tendency to leave slumping players out there to die. He also single handidly handed the ’62 Giants the pennant by completely bungling the ninth inning of the playoff game, (game 165 of the season), depriving Dodger fans the NL Pennant with what was arguably their strongest L.A. team ever. You loved Tommy Lasorda did you? Remember how Tommy would leave starters out there when they were fatigued and had next to nothing left in the tank. He burned out Fernando Valenzuela by age 28. Orel won it all in ’88, but by ’90 he was going under the knife due to too many innings. And then there was the Tommy that failed to recognize the talent he had in front of him. Players like John Franco, John Wetteland, Mike Devereuax, Rick Sutcliffe, and Pedro Martinez were dealt away. Some completely out of favor with Lasorda, others never given a shot. Tommy liked to bunt too. The squeeze play was a favorite of his. He also did unthinkable things like pitch to Jack Clark in playoff games. As a strategic manager, I’d never consider Lasorda to be in the top tier. He motivated his guys like none other, but he seldom made that chess move that was a game changer. We’ve dealt with Bill Russell, Glenn Hoffman, Davey Johnson, Jim Tracy, Grady Liddle, Joe Torre and Don Mattingly since. Was there anyone in that group that you were happy about? There seems to be a fraternity of men in the game that are considered managerial candidates. Very few are potential managers that I’d get excited about. I see no modern day Earl Weavers in the mix. Weaver played for the big hit, and he understood that bunting was not an important part of the game, but the walk was. He wanted guys on base for his mashers who would drive them in. There are so many National League style managers out there. You know, the guys that play for one run. Advance runners through outs. Sacrifice bunts, hitting to the right side. Playing for sacrifice flys and such. “Small ball” was the term used for Gene Mauch. A much respected field manager that never got his team to the World Series. Mauch’s “little ball” or “small ball” approach kept the Angels out of the World Series. These types of managers aren't rare. Mike Scioscia, Bruce Bochy, Bud Black, all manage in that fashion. Some have had success but little of it was from their strategic skills. Mattingly might lead the pack in "little ball" managing. The other night was a perfect example of why a manager like Mattingly will drive you nuts with his small ball approach. 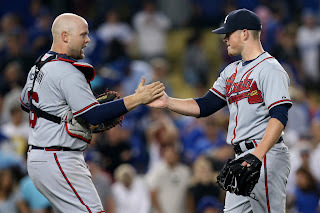 The Dodgers were down a run to the Braves in the bottom of the ninth against Craig Kimbrel, probably the best closer in the game. Schumacher singled to lead off the inning and Tim Federowicz came to the plate. Now with Kimbrel’s 100 MPH rising fastball. You would think that Mattingly would consider letting his catcher swing away and attempt to meet power with power and hope the he could give that thing a ride. Fedex isn’t much of a bunter and even the best of bunters will have difficulty laying one down on a fastball high and in. But Donnie Ballgame put out the bunt sign and lickety-split, Federowicz was down 0-2. He didn’t have a chance in that at bat. Kimbrel retired him via strikeout and Mattingly essentially handed an out to the best closer in the game. There are those that obsess with the Brandon League loyalty of the Dodger manager and they do so with justification, but it is the in-game strategical situations (such as the Fedex at bat the other night) that drive me crazy with Mattingly. He did it again tonight in the 8th inning with Castellanos up. Bunted again, this time Castellanos called out running into his own bunt out of the batters box. Another free out, courtesy of the Dodger manager. I read in some blogs and message boards of a call for Kevin Kennedy as manager. I like Kevin and I think he’d do all he could to make the Dodgers a better club, but I question if his decisions would be much different than those made by Mattingly. Would he have the fortitude to take charge and bench a slumping player owed millions of dollars on his contract, such as Andre Ethier? I could be wrong, but I doubt it. Would he have the power to influence front office decisions to call up such players as a Yasiel Puig or a Joc Pederson? Maybe, maybe not. Kennedy had a tendency to play vets in Texas that were not performing, but had a reputation. I'm thinking specifically of Jose Canseco. For those that think a managerial move would make a difference, I simply state that I don't think there isn't anyone waiting in the wings to be hired that would be much different than the man making the moves right now. Changes sometimes work on the short term, but in the long run, a managerial switch would have to be with someone that will take a dramatically different approach in decision making. Who that would be, I haven't a clue. Seriously, I've given this some thought and there really is nobody out there that is innovative enough for my taste to fill the Dodger manager position. Maybe some of you out there have some ideas. I'd love to hear them. LOS ANGELES – Los Angeles Dodgers rookie outfielder Yasiel Puig, who enjoyed a historic debut week, has been named National League Player of the Week for the period ending June 9th. The announcement was made earlier today on MLB Network. Puig made his Major League debut on Monday, June 3rd, going 2-for-4 in the Dodgers leadoff slot while recording his first outfield assist in game-ending fashion, doubling-up San Diego’s Chris Denorfia at first base with a throw from deep right field to preserve a 2-1 victory. 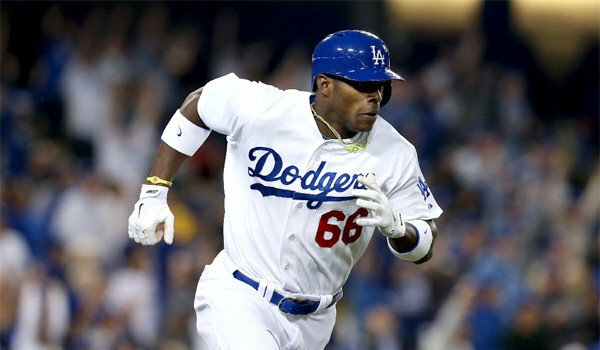 Puig became the first Dodger to record a multi-hit performance in his first big league game since Russell Martin went 2-for-4 in his debut on May 5, 2006. On Tuesday, Puig went 3-for-4 with a double, two home runs and five RBI in his second Major League contest, leading the Dodgers to a 9-7 win over the visiting Padres. According to Elias Sports Bureau, Puig joined Dino Restelli as the only players in Major League history to have recorded a two-homer, five-RBI game within the first two games of his career. Restelli accomplished the feat on June 15, 1949 as a member of the Pittsburgh Pirates. On Thursday, Puig went 2-for-4 with a home run and four RBI on the way to a 5-0 victory in the first game of a four-game set with the N.L. East-leading Atlanta Braves. The young phenom clubbed his first career grand slam in the bottom of the eighth inning, giving the Dodger bullpen a five-run cushion as they closed out a 7.0-inning scoreless performance by starter Zack Greinke. In Friday’s matchup between the two clubs, Puig’s game-tying solo homer in the sixth inning was the only run the Dodgers scored off Braves starter Paul Maholm in an eventual 2-1 extra-inning victory for Los Angeles. 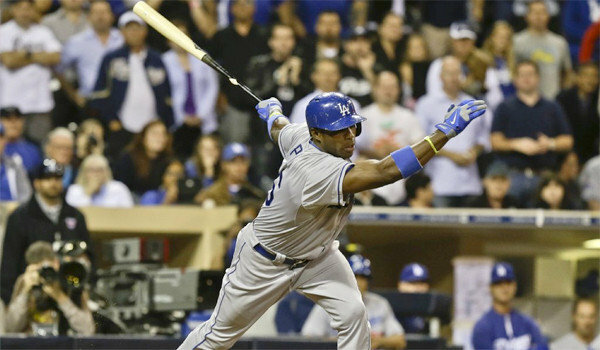 With the homer, Puig became just the second player since 1900 to hit four home runs in his first five games, joining Mike Jacobs of the 2005 New York Mets (Elias Sports Bureau). The solo shot gave Puig 10 RBI through his first five career games, tying a Major League record (also: Washington’s Danny Espinosa in 2010 and Pittsburgh’s Jack Merson in 1951). With his first Player of the Week honor, Puig becomes the first rookie to win for his debut week since Baltimore’s Manny Machado (A.L.) (August 6-12, 2012). In addition, he is the first Dodger rookie to win the award since Andre Ethier (July 3-9, 2006). The magic of Yasiel Puig has allowed Dodger fans to forget the massive injury bug that continues to plague the team. In less than one week we've seen Chris Capuano return to the D.L., starting catcher A.J. Ellis join the 25 day list and now Ted Lilly (neck) and Hanley Ramirez (hamstring re-injury) are potential returns to the injury front. 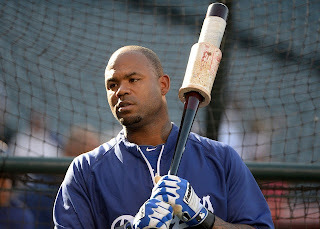 Additionally word has been received that Carl Crawford’s hamstring injury is something that will take weeks of recovery time and Mark Ellis is playing with a slight groin strain that explains his drop in offensive production and rare defensive laspses the last few weeks. The Hanley injury is particularly disturbing as he’s only had 20 at bats this season and it looks to be a prolonging setback that could linger for much of the rest of the season. Tack all that on with news that Scott Elbert, who was looking very good in minor league rehab assignments, blew out his elbow in his last one, requiring Tommy John surgery. Incredibly there are more injuries and a disabled list full of Kemp, AJ Ellis, Capuano, Billingsley, Elbert, Tolleson, and Beckett tells that story. What we have is the most snakebit Dodger team in history with regards to injury and a five game stretch of Yasiel Puig has allowed us to not think about that. 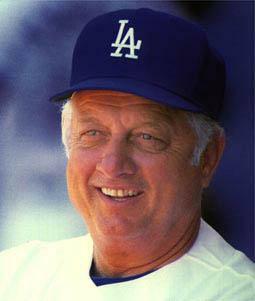 He has played a major role in each Dodger victory, all four of the Dodger wins in which has has participated. With four home runs and ten RBI in five games, Puig's performance has been matched by few other players in baseball history with such a hot start. 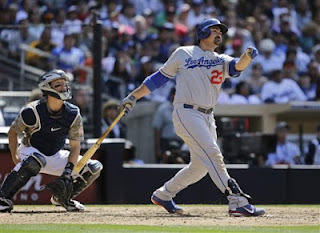 It was noted on the think Blue LA message board (contributor, Kevin Sparkhul), that he has hit the cycle in homers with a one-run, two-run, three-run and grand slam homer. Puig was given the ultimate respect as Brave manager Freddy Gonzalez elected to intentionally walk him in the 8th inning of a 1 run game rather that allow the rookie to beat him on two consecutive nights. It’s hard to imagine another rookie of 5 games of experience getting that kind of treatment. Such is the impact of Yasiel Puig and it is an impact that is taking notice across the country. "Puig is a beast!" was the email message I received from Troy, a close friend living in Louisiana. The MLB network is actually breaking in to their night time coverage to watch his at bats, something unprecedented with the three year old network for a first year player. 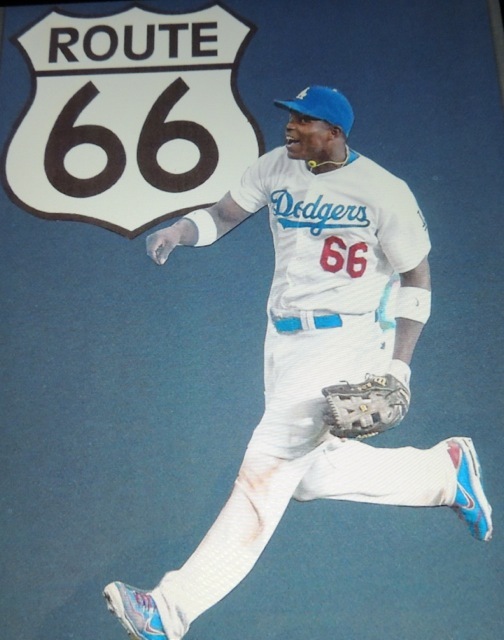 But Puig isn't just a first year player, he's a superstar in the making and until scouts teach their respective pitching staffs to pitch to his weaknesses, we're going to ride "Route 66" forward. The inevitable will occur though, and it needs to be noted. Puig will have his rough patches and the league will adjust. Where Yasiel's fortitude will be tested is when he has to react to failures in the long course of a season. When a team is mired so deep in the standings, it's usually best to simply win and ignore where they stand for a while. Such a tactic is proving useful even if the Dodgers haven't gained much ground on the 1st place D-Backs. The remainder of the pack is slowly moving back towards the Dodgers, sin ce Monday's action when Puig arrived, the Dodgers have gained three games on San Diego, two on San Francisco, one on Colorado and one on Arizona. Couple that with the fact that they just beat Atlanta twice, the team with the best record in the National League, and are on the verge of that elusive second three game winning streak of the SEASON (their first since the second series of the year against Pittsburgh), maybe this team is on it's way out of the cellar. Meanwhile we can continue to enjoy the ride on the Puig express as the Braves make adjustments and attempt to figure him out. Tonight's action promises to be another exciting event as the Dodgers host their first Old Timer's Game in years, which will be live-streamed at losangeles.dodgers.mlb.com at 5:20 pm. Tonight's Dodgers/Braves action will feature Medlen (2-6, 3.14 ERA) vs. Fife (1-0, 4.50 ERA), starting at 7:10 pm.